Hot summer days mean one thing to me: blackberries are ripening! It’s usually sometime in August that we start foraging for blackberries, and I always make sure to reserve some for making a gallon (or two or three) of blackberry mead. Of course blackberry cobbler and crisp will also be made, and they are delicious, but blackberry mead is really what it’s all about! 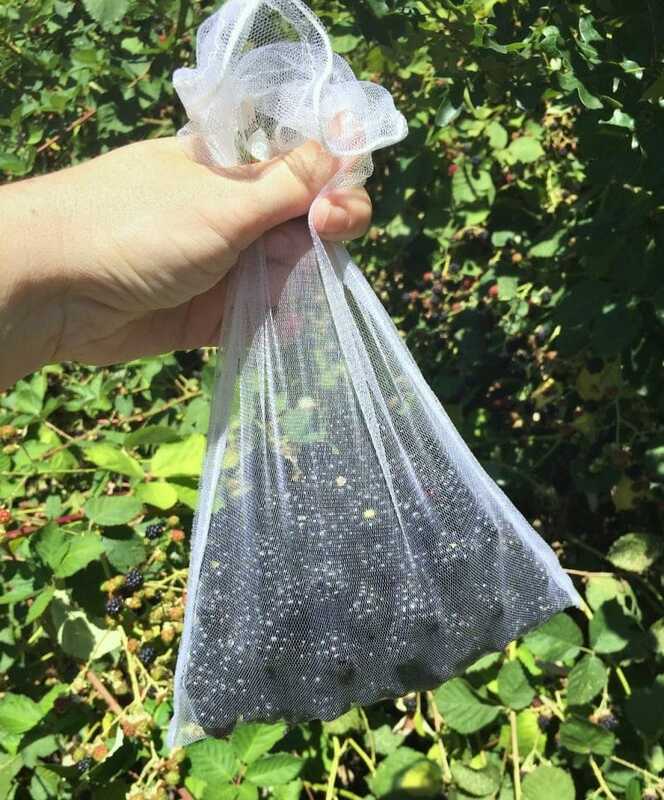 We recently went out and collected the first ripe blackberries of the season. Sometimes blackberry brambles get a bad rap, and I can understand that concern, but you’ll never hear me complaining as I’m gathering bucket loads of tasty and sweet berries! 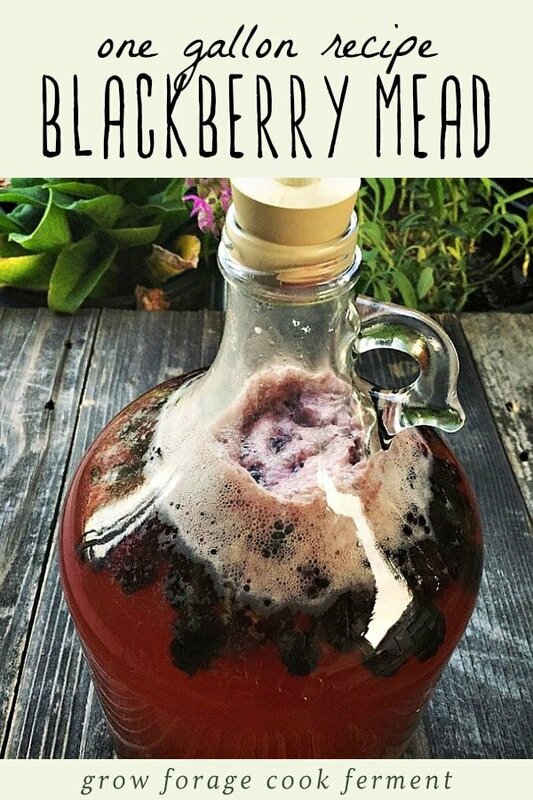 This blackberry mead recipe is a variation on my simple one gallon mead recipe. For more detailed directions and photos of the process, head on over to that post. If you don’t have access to fresh blackberries, frozen works just as well. I’ve made this recipe for several years now, and it’s always a favorite. It comes together quickly, which is part of why I love making simple meads and wines, as they are so easy to make. 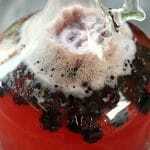 This blackberry mead is also so pretty while it’s fermenting, it makes it hard to wait! 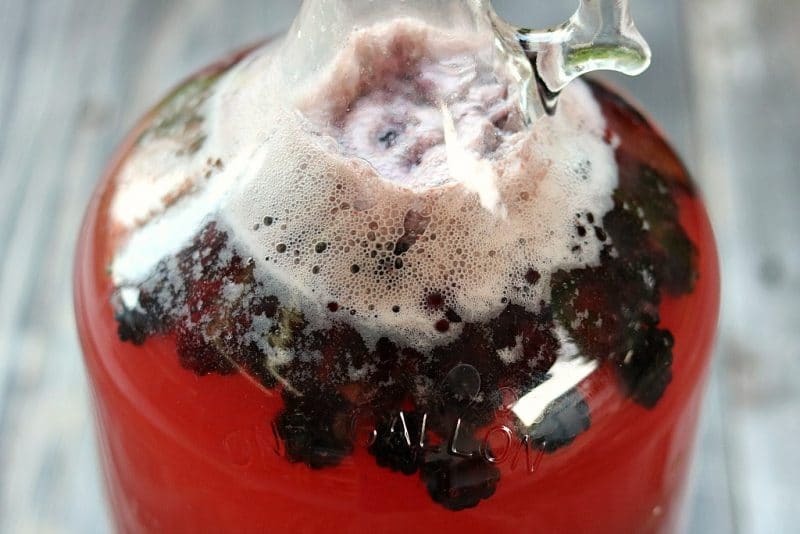 This blackberry mead will be the perfect treat once fall is here. I will definitely be making a few more batches of this one gallon recipe before summer is over! 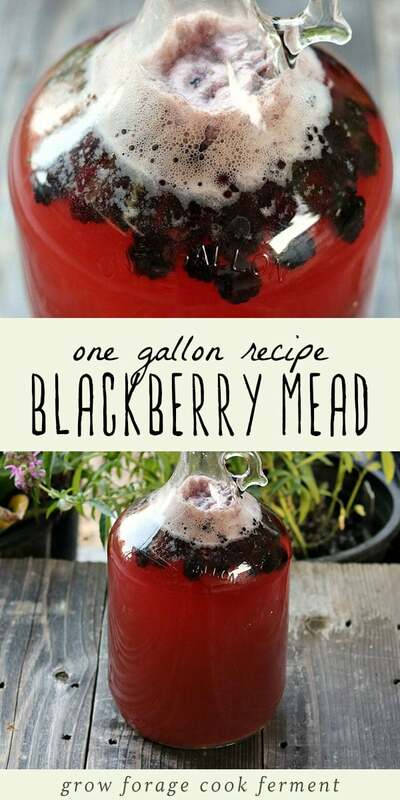 Make this simple and tasty blackberry mead recipe when blackberries are in season! 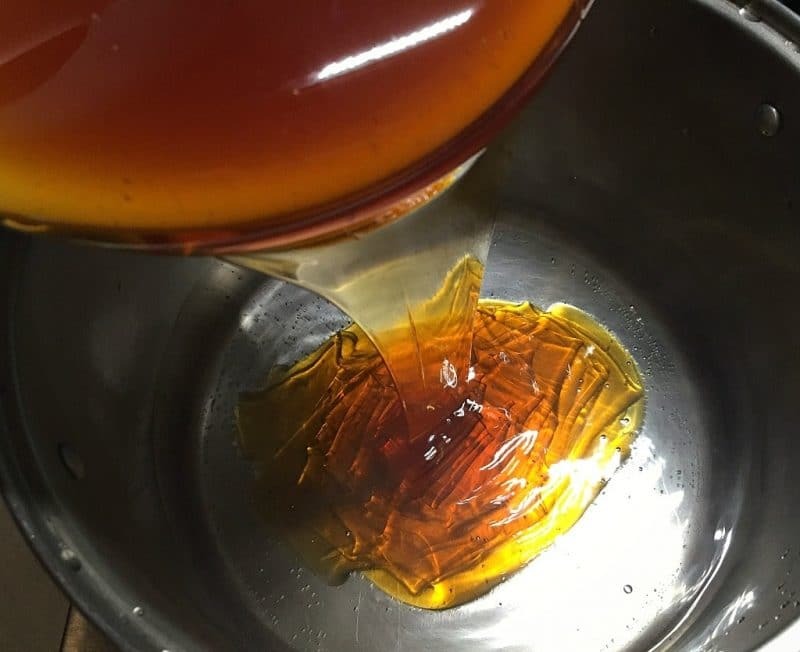 2-3 pounds honey depending on how sweet you want to end product to be. Heat about 1/2 gallon of non chlorinated water in the pot on medium heat. Once it's warm, but not boiling, add the honey and stir it so it all dissolves. Turn off the heat. 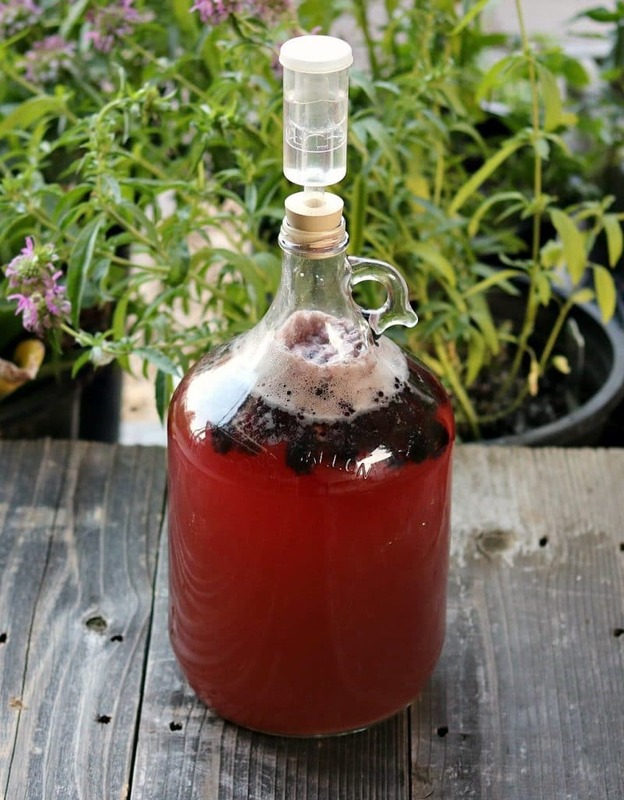 Put the blackberries into the one gallon jug. Carefully pour the honey water mixture into the jug using a funnel. Top off the jug with cold (preferably filtered) water, leaving at least 2 inches of head space on top. Put the lid on the jug and gently mix everything around a bit. After about 6 weeks of fermenting, or once the bubbling has completely stopped, the mead can be bottled and aged. Thanks for the info and recipe. Having never done this before……..I think I have an issue. 48 hrs after following the steps…….I have no bubbling going on? What can I do to salvage the recipe? Hi Frank, sounds like you need to try adding more yeast. It should definitely be bubbling within 24 hours! Do you ever rack it or secondary ferment? Have you delt with bottle bombs before? can i make this recipe without the berries? I want a basic mead in a 5g carboy to then add fruit in secondary. I made one batch of mead after aging turned to vinegar. Do you need to add anything to stop this. Your recipe how long can you age this , a year ? Hi this is a great resource abs thank you for your advice and input. I to have followed your recipe and all had gone well. It looks a good for colour although it had taken 8 weeks for fermentation to stop. I left it outside in cold weather one night to drop the sediment which it did. I tasted it today and it tastes like vodka! It certainly warms but there is no taste of blackberry. I’ve tested cornish mead and it is much more fruitful does this cover with ageing or is there another way to make it tasty. I’m interested in making this but if I use fresh, storebought blackberries, how do I sanitize them? Or do I? Would frozen be better? And where do you get your honey from when you make your mead? Is it commercial or local? You don’t need to worry about sanitizing the blackberries. Either frozen or fresh will work just fine. I prefer to use local raw honey for my mead, but any honey will work! mmmm! love your recipe! always so easy and clear. is there any reason you only use the half packet of yeast? I accidentally put the whole packet of it. do you think it will be still alright? Your husband is right, no need to worry about it! This sounds pretty tasty. I have a batch of traditional mead that’s bottled and aging now. I’m gonna try to hold out until Christmas before I uncork the first bottle. My mother-in-law has wild blackberries on her property. I was thinking about mashing the blackberries up and using my fermenting bucket for the primary ferment then transferring to.my 3 gallon carboy for secondary, then racking and racking again before bottling. Have you used this method before? Yes, that method works great! Instead of an airlock, a large balloon can be placed over the opening of the jug. The gas from fermentation fills up the balloon but it won’t pop. The gas gradually escapes thorough the pores of the balloon, but will not allow air back in. With as cheap as airlocks are, why wouldn’t you just go with an air lock? I wouldn’t fully trust the balloon method although I have seen people use it. I have 3 airlock and doubt I paid much more than $5 for all.of them. When my dad brews beer, he takes a hose that fits the hole in the airlock and runs it down to a glass with water in it to help vent off the gasses more efficiently. Once the fermentation slows a bit, he puts an airlock on. This method helps with large amounts of foam. Correction: He fits a hose in the rubber stopper not the airlock. I use the balloon method more because I’m used to it because I make my own Jenkem. Balloons are definitely the preferred method for that. This sounds wonderful! Will adding more berries make fruitier mead. One cup berries to a whole gallon doesn’t seem like a lot. Also, will crushing the berries yield more flavor? Thank you so much! If you were to put 1-2 pounds of berries in the bottle but crush and strain them, would it be ok to skip the fermenting bucket step? Also, with crushing and straining, would you put the crushed berries in the bottle or just the juice? Thanks! Hi, I have a gallon of mead that has been in its first fermentation for 4 weeks now. The bubbles have stopped. Do I use your cider bottling method for the mead? If so, once bottled how long should I let it sit before drinking? Yes, my method for bottling cider is the same for bottling mead. I usually try and let it sit for at least several weeks, but it does get better with time, so the longer you can wait the better!